In case you didn’t get the memo, the Mother’s day festivities were extended a week longer than usual this year! Mothers and daughters were out in full force at GIGTX- Spring. Oh my, we hit the Mother lode! On May 19th Girls in Gis returned to the Houston area for GIGTX-Spring! Ground Dwellers graciously opened their doors to thirty-seven women and girls ranging in experience from it being their first day to black belts and ages six to sixty. It was a full house and Jacqueline Dalton Avelar, with the help of Rachael Champagne, confidently led the charge and shared her passion for Jiu-Jitsu with the group. Like most awesome GIG events it began with a warm up, then on to the technical portion where Jackie showed an arm attack from the guard and Rachael showed a triangle from the mount. Then it was time for everyone’s favorite, open mat. Jackie and Rachael’s passion for the art combined with their warm nature made for a wonderful GIG event. We also had some GIG patch giveaways. Briana Lopez planked for seven minutes and won a large GIG patch and Cora Sek won the GIG raffle. Congratulations girls! 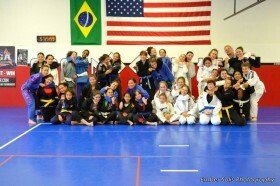 There is no greater joy than looking out and seeing a sea of women and girls training BJJ. Or watching daughters encourage and reassure their mothers as they take their first step on their Jiu-Jitsu journey. Or to see a brown and black belt mother daughter team that have shared their journey together. GIG-Spring TX was special in so many ways, but mostly because of the connections made between everyone and the positive impact left behind. Watching several family generations of strong women and girls and those from otherwise separate worlds come together because of their common love and interest, was powerful. Thank you Jackie and Rachael for being an outstanding host and thank you to Ground Dwellers for your big-heartedness! Thank you to Lana Hunter for taking care of business. Thank you to Ember Solis Photography for shooting some nice shots for us. And thank you all for coming out to GIG-Spring and for making this event such a triumph!